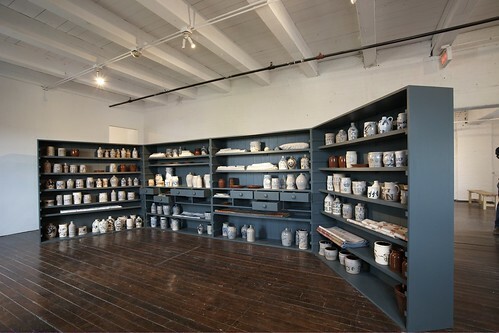 Allison Smith’s diverse artistic practice engages in an investigation of the cultural phenomenon of historical reenactment and the role of craft in the construction of national identity. Smith uses history as an aesthetic palette to produce sculptural installations and live art events alluding to contemporary social conflicts around notions of gender, art/craft, and war. 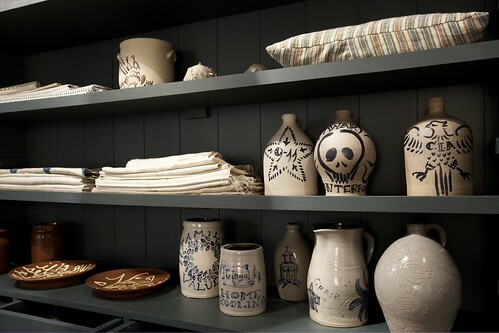 Jugs, Pitchers, Bottles, and Crocks, Household Linens and Yardage in Stock is an ongoing project that will grow and change over the duration of the exhibition. 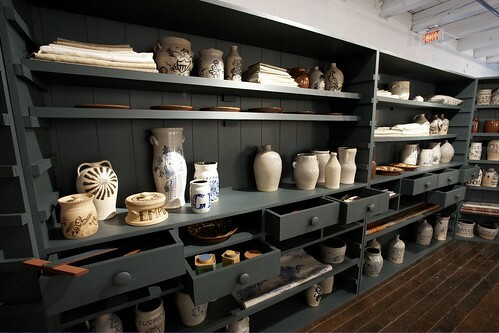 Inspired by early American history, living history museums and the use of decorative objects, textiles and costumes as narratives of that history, Smith has created a cabinet based on the general store most popular in late 18th and early 19th century America. The relationship between museum and retail store is a timely one. While there is no “for sale” sign for works in this Mattress Factory show, all the artworks are essentially for sale. Smith is interested in art as an alternative economy. Like a merchant or trader/shopkeeper, Smith presents her wares in a three-sided cabinet that suggests portability. Interactivity is key to the work. She often apprentices with local artisans to learn the skills necessary to realize her projects. 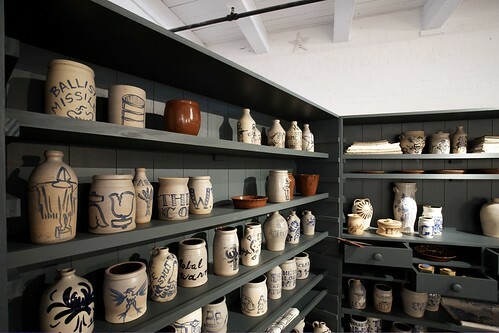 Working with ceramic artist Bernard Jakub, Smith created traditional pottery forms including stoneware and redware jugs, crocks, pitchers, plates and bottles. All of these vernacular, functional forms were primarily utilitarian. Smith is also interested in the rare examples that were commemorative and/or political. For this project, Smith has taken these early examples (form) and imbued them with contemporary significance (content) choosing images, words and phrases from our current time period that do not get commemorated. The objects highlight the failures of our government and the precarious state of the natural world – all things that cause anxiety -- like the present war with Iraq, global warming, genetic engineering and homeland security threats. Smith also created linens for the cabinet. Decorative printed textiles with floral designs, repeated motifs and scenes inspire the linens. Smith worked in her own imagery in response to the legacy of propaganda textiles made in wartime. We're very excited that Zany Umbrella Circus will perform tomorrow night at the Urban Garden Party. Ben and Sarah have been rehearsing all week here at the museum. Their performance is a choreographed repelling dance that takes place on the side of the museum's exterior wall. It looks amazing. Ben was kind enough to send us some low resolution video of a rehearsal from earlier this week. Tickets for the 2008 Urban Garden Party are still available. Order online by CLICKING HERE, or call 412.231.3169 to place your order by phone. 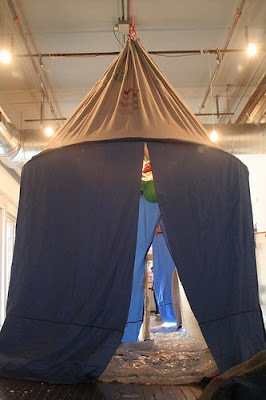 Casey Droege has posted some photos taken during the last Factory 14s class, SOCIAL FABRIC. Casey is an artist and arts educator, and worked with the Factory 14s students this past spring. View Casey's complete Flickr stream HERE. The Factory 14s Youth Art Course provides intensive art-making experiences for students ages 14-18. It is designed to introduce teens and young artists of all backgrounds to the choices, decisions, methods and materials relevant to the creation, presentation, and interpretation of installation art. 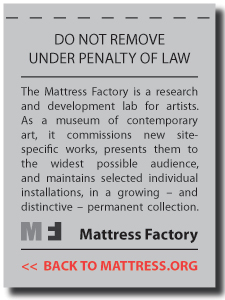 Under the guidance of professional artists, students engage in a creative process that closely mirrors the Mattress Factory's artist-residency program. Enrollment is now open for the next Factory 14s session which begins on July 15. PORTABLE ARTWORKS, taught by artist Ally Reeves, will encourage students to develop both independent and collaborative projects that explore art-making that is portable and beyond the studio setting. 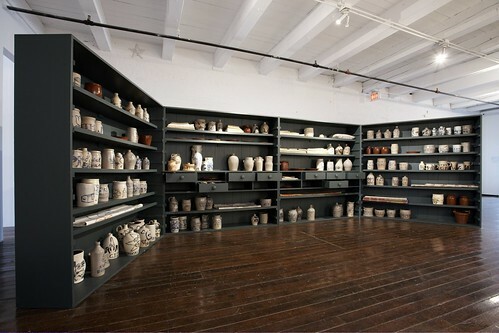 Works may involve performance, sculpture, sound, fabrics, installation and adapting their choice of medium to consider place, people and conversation as malleable media, responding to the history of a neighborhood, a physical setting they are interested in, or their own role/identity in the city of Pittsburgh. UPDATE: Be our virtual friend at the Factory 14s MySpace page and the Mattress Factory Flickr Photostream. Elaine King wrote a very nice review of INDIA: NEW INSTALLATIONS (Part I & Part II) in the June issue of Sculpture Magazine. They don't publish the magazine's full content online, but find out how to get it HERE. Blogger Michael Fulk reviews INNER AND OUTER SPACE. About mid-April someone from the Mattress Factory invited Pittsburgh bloggers to have media access to the April 25 opening of the new exhibit Inner and Outer Space. As I had not visited the Mattress Factory before, I figured I would take the opportunity to explore another museum/gallery and see some new art. Not that I hadn’t heard of the space previously, my friend Heather Mallak of monkey museum has done some work there in the past. Plus, it’s only about 5 minutes from work.